Life insurance premium is eligible for deduction under section 80C and Maturity is tax free Under Section 10(10D). But this is not 100% correct under Current Taxation Rules as deduction under section 80C as well as exemption under section 10(10D) is available subject to some conditions.What are these conditions ? We will cover this topic in Two post ,In present post we are discussing various condition and rules under Section 80C for Life insurance Premium and in other post we have covered Income tax exemption of Life insurance maturity amount and conditions as section 10(10D) of Income tax act. An Individual can claim deduction for Life Insurance Policy on life of himself, his spouse or his children. So as a parent you can claim tax benefits for life insurance premium of your children whether dependent or independent ,married or not married ,Major or Minor but reverse is not true and thus children can not claim tax benefits in respect of life insurance premium paid on life of parents. The HUF can claim deduction for premium on life of any of its members. "Whether life insurance premium paid on the life of following is eligible u/s 80C ?" 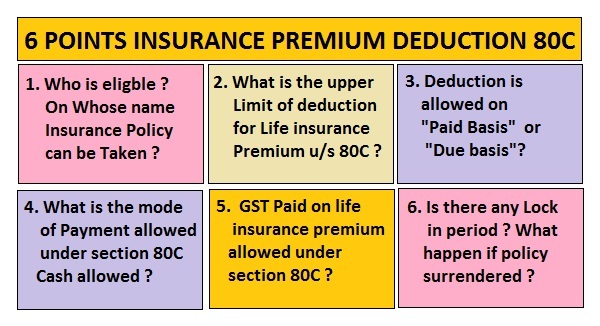 To check the answer Like us on Facebook or Twitter and then Lock will be opened.Before going in to the details ,please select your options and check your understanding with the income tax provisions of Section 80C with respect to life insurance Premium ? Relevant provision of Income tax : Provision are very precise,compact and simple and without any confusion and given below. Though the act is very much clear yet to clarify the issue department has also issued circular on one of the aspect of the issue in the past. Premium paid on policies in name of adult children - Relief under section 80C is available in respect of premia paid on the life insurance policies on the lives of adult children, irrespective of their status; for example, premia paid on a policy on the life of a married daughter. This relief will continue to be available under the new section (section 88) introduced by the Finance Act, 1990, as the language of the new section is in pari materiawith that of section 80C of the Act—Circular : No. 574, dated 22-8-1990. Same Rule applicable on three other investment types:"For the purposes of clauses (i), (v), (x) and (xi) of that sub-section"(given with yellow background above) It means that the same rule is applicable on four type of investment . 2 Amount of Deduction under 80C on Life Insurance Premium. Whether Full amount of Life Insurance Premium is allowed ? (Sec. 80C). As per Section 80C(2) any sums paid or deposited in the previous year by the assessee—(i) to effect or to keep in force an insurance on the life of persons specified in sub-section (4); is allowed as deduction. If Policy is taken on or after 01.04.2012 then only 10% of "Sum assured" is eligible for deduction. Example 1:Arun has taken a Life Insurance policy on 01.04.2014 with a sum Assured 4 Lakhs and paid a Premium of Rs 60,000 in Financial Year 2017-18,What is the eligible amount under section 80C? In this Case Arun is eligible to claim 10% of Sum Assured(4 lakh) i.e Rs 40,000 under section 80C. out of Total premium paid Rs 60000 during Financial Year 2017-18. Further Above rule is applicable on policies issued on or after 01.04.2012(10%) and if the policy has been got issued between 01.04.2003 to 31.03.2012 then maximum 20% of sum assured would have been allowed . Moreover if Policy has been issued before 01.04.2003 then you can claim full premium paid under section 80C without considering 10%/20% Limit. Term Plan : The 10 % rule is applicable on term plan also , however in case of Term plan sum assured is much more than 10 time of the premium paid in Financial year. Unit linked plans and Traditional Insurance plans : In Both cases 10% rule applicable ,Further in case of ULIP ,Top up premium can also be deposited and 10% rule is applicable on TOP-up premium also. Example : Rahul has taken a Single premium insurance policy and paid Rs 100000/- as premium during Fy 2017-18. Sum assured of the policy is Rs 125000/- . How much amount is eligible for deduction under section 80C ? Ans: 10% of the sum assured (10% of 125000/-) i.e Rs 12500/- . So Rahul is allowed to claim deduction of Rs 12500/- only under section 80C for Life insurance premium paid. Pension Plan with death benefit or zero sum assured :These plans are generally marketed by insurance company and understood as insurance policy and claimed as deduction under section 80C but actually these plans are covered under section 80CCC and 10% rule is not applicable on such plans .In few plans sum assured is zero even then they are eligible for deduction under section 80CCC. So Keep in mind this point that every paper /receipt issued by Insurance company is not always an Insurance policy. 3.Whether Deduction is allowed on Payment basis or due basis ? Example 2 : Ram has taken a Policy in March 2016 ,with sum assured as 2,00,000 and annual premium as 20,000.In March 2017 he had not deposit the premium and deposited the same in April-2017.What is eligible amount under section 80C if he pays March 2018 premium in Time ? In present case Ram has paid Rs 40000/- in Fy 2017-18 but he is not eligible to claim deduction on Rs 40000 in FY 2017-18 as the amount is restricted upto 10% of the sum assured. In this case 10% of sum assured is Rs 20000/- so Ram is eligible to claim deduction of Rs 20000 only. So Be Alert if premium of your insurance policy is due in March, and your annual premium amount is around 10% of the sum assured then pay the premium in March 2018 it self ,otherwise you will have to face same problem as faced by Ram in above example. Life insurance premium can be paid in Cash or through cheque/draft or through Internet Banking /Debit or Credit card or any other electronic mode.No restrictions has been placed under section 80C. 5. GST paid on Life insurance Premium allowed as Deduction ? In other case:In other case before payment of Two years Insurance premium . In Case of Unit Linked Insurance Plans premium has paid for 5 years. If you violates above rules then deduction claimed in earlier years will be added in the Income of the previous year in which rules are violated. Example 3 : Rajiv has taken a Life insurance policy in fy 2016-17 with sum assured Rs 5 lakh and annual premium of Rs 50000/- . He has claimed deduction of Rs 50000 in fy 2016-17. In Fy 2017-18 he has not paid the premium and has terminate the life insurance contracts and taken surrender value from Life insurance company ,what will be provision under section 80C applied in this case ? In this case Rs 50000/- will be added back as Income of Rajiv in fy 2017-18 due to violation of Policy lock in period under section 80C as a reversal of Deduction claimed in earlier Financial year 2016-17. 80C. (1) In computing the total income of an assessee, being an individual or a Hindu undivided family, there shall be deducted, in accordance with and subject to the provisions of this section, the whole of the amount paid or deposited in the previous year, being the aggregate of the sums referred to in sub-section (2), as does not exceed one hundred and fifty thousand rupees. the provisions of this sub-section shall have effect as if for the words "ten per cent", the words "fifteen per cent" had been substituted. For single premium policies, the minimum SA criteria...is it fixed for 10 times or it is subject to Income Tax laws...?? If Assesses pays LIC Premium of her major married son can she claim this amt under sec 80 C in het taxable computation ? Nice write.....really like articles of Raja Babu.....so simply explained...beautiful. Very good Mr. Raja Bau, you've explained neatly in simple word and covered mostly on Life Insurance Premium. This will help the taxpayer who is wrongly availing deduction under this section. thanks. Whether maturity amount received with bonus is exempted ?